* If you prefer, you can see a .pdf version here (2.98 Mb). It has been nearly two months since we saw many of you on our whirlwind Home Ministry this summer. Now that we are finally settled in to a Fall routine, we would like to report to you about our summer and briefly update you on the ministries here. * Churches: We were able to visit most (but not all) of our supporting churches. At some we shared during the worship service, while at others we spoke to the adult Sunday School class, met with the mission committee or hung out at a “meet-n-greet” for those who were interested. 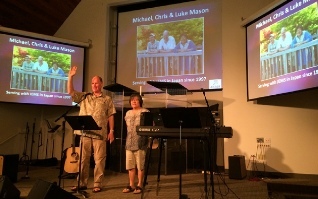 We are thankful for the opportunity to share about the work at Oasis Church and Kansai Christian School, and were greatly encouraged by the support and prayers we receive from these wonderful churches. * Family: We were able to make short trips to Portland, OR and Spokane, WA to see Michael’s family, but most of our time was spent near Chris’ parents. We actually stayed in guest housing at the retirement center where they are residing, so we were able to see her folks almost every day. A highlight was celebrating her mother’s 85th birthday with a big birthday cake for all of the residents on their floor. * Fun: In the midst of the busy-ness of home ministry, we always try to find time to do some things that we can’t do in Japan. This summer we visited Disneyland (paid for by some very dear friends) and saw the Dead Sea Scrolls at the California Science Center. 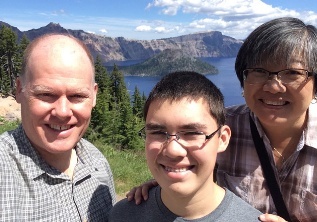 We also passed through Crater Lake National Park in Oregon, spent a day in San Francisco, and Michael ran in two 5k races (including one with Luke on Father’s Day). * Food: Eating is always a lot of fun when we are at home as it allows us to get foods that are either expensive or hard to find (or both) here in Japan. Some of our favorite restaurants that we tried for the first time were; Pieology Pizzeria, Five Guys Burgers and Fries, the Kogi Korean BBQ food truck and Wahoo’s fish tacos. Mmmm! We are always thankful for the opportunity to visit the States. It would be nice if there was a little more time for rest, but just a change of pace from life in Japan is a big blessing. It is also nice to reconnect with many old friends. Thank you to everyone who made the effort to see us while we were home. 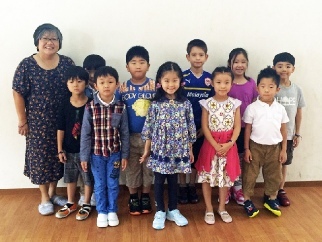 After returning from our summer in the States, Chris had less than a week to prepare lessons and set up her classroom before the first day of school. She was nervous about her new responsibility as the full-time 1st/2nd grade teacher, but now that she has two months experience under her belt, she (and the students) are adjusting well. All of this year’s 1st graders come from Japanese-speaking families, so simple English is still a struggle for many of them. This means that Chris is not only teaching the regular subjects, but is having to do it in an ESL environment. This is a big challenge, but Chris loves her students and enjoys spending time with them each day. PLEASE PRAY for God’s strength, wisdom, patience and love as she teaches her students each day. May the Lord use her both to both teach their minds and to nurture their hearts. With the start of the new school year, Luke is now a high school student. He seems to be adjusting well to the more demanding work load and is enjoying his involvement in student government, the yearbook staff and the worship team. PLEASE PRAY for much academic and spiritual growth for Luke this year. Michael is returning for another year as all-school chaplain. His theme for this year is “Not of this World: Following Jesus in a World that Doesn’t.” There is a good group of high schoolers this year who really seem eager to follow the Lord. PLEASE PRAY that Michael’s messages would encourage them to go deeper in their relationship with Jesus. Oasis Church seemed to do well this summer while we were away. Different people in the church stepped up and covered for us in the areas of teaching and leading worship. While the people said they were happy that we are back (that’s nice! ), we are encouraged by the growth in confidence and in their willingness to serve that happened in our absence. PLEASE PRAY that the church would use this summer’s experiences as a stepping-stone for further growth. PLEASE ALSO PRAY for the time we spend together each Sunday morning studying of 1 Corinthians. May the Lord use this wonderful book to teach, equip, and lead us to become the people He wants us to be. Well, that’s all for now. Once again, thank you for all of your prayers and support on our behalf. We are truly grateful for your partnership with us as we serve the Kingdom here in Japan. As we look ahead to the holiday seasons, may the Lord bless you beyond what you can imagine.